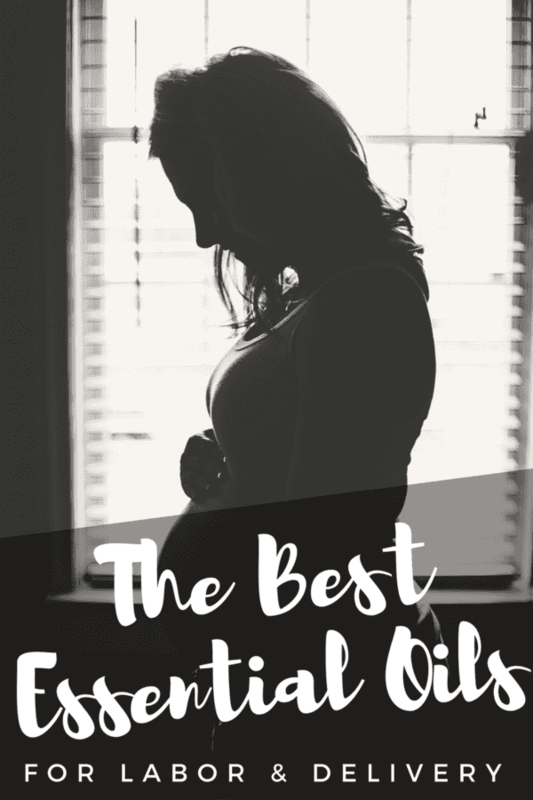 The best essential oils for labor and delivery – create a calming birthing experience with the help of these must-have essential oils. Whether you are expecting your first or fifth, labor can involve lots of changing needs. Every one of my labor experiences was different. While some of my children arrived rather fast, others took hours and hours of active labor. Your needs and feelings will change a great deal too. You might be excited. But then you might experience crying. You might someone to hold your hand, but then you might just want everyone to get away from you. Thankfully this is normal. Thank goodness there are essential oils that you can use to help manage your moods and feelings to enhance your labor experience. Whether you choose to give birth at home, a hospital or in a birthing center, essential oils can work to help bring physical & emotional comfort to your labor experience. Recommended Essential Oils for Pregnancy are a little different than those suggested and highlighted below for active labor & delivery. One thing to remember though is that not all oils will work the same for everyone. It’s important to find those that work best for you, and always reference the usage instructions to ensure you are using them safely. There are a variety of Essential Oils that you can incorporate into your daily regimen when you are expecting. But when it comes to labor, some oils are better than others. Peppermint is a great pick me up – especially when you need to stay awake and alert. Simply inhaling a drop of peppermint for quick energy is always helpful. When in labor, dilute with a carrier oil and apply to the back of your neck to help provide a cooling effect. You can also add Peppermint Vitality to your water to help aid in digestion, too. Lavender is great to support your mood – it has a calming, relaxing effect on the body and can help bring about a sense of calm in the delivery area. Diffuse in your area to help create a sense of relaxation during your labor experience. Or, add Ylang Ylang or Lavender to a roller ball as a blend. Or as a single oil to roll on your wrists to allow yourself the opportunity to smell your wrists occasionally when you need extra support. Lavender is also great to support the skin. Marjoram is great for the discomforts of actual labor. You will want to dilute and apply to your lower abdomen if you experience cramps with labor. Even after labor and delivery, if you are a nursing Mama, Marjoram helps with the cramps that may occur as you begin your nursing experience. The Grounding Blend consists of 3 oils … all of which will help create balance in the labor & delivery room. Use it for mental clarity and emotional balance by applying to the bottoms of your feet and the back of your neck. Don’t have the Grounding Blend? You can make your own Grounding Blend by combining 2 drops of Roman Chamomile, 3 drops of Vetiver and 3 drops of Sandalwood. This is a wonderful oil to diffuse in the labor and delivery room. It’s uplifting and can help balance your emotions Use alone or combine with lavender and fractionated coconut oil and rub on your back and shoulders for relief – and to enhance circulation. This is one of the best oils you can invest in. It is a powerful way to support a healthy recovery and placenta delivery. For maximum effect, add 1-2 drops with fractionated coconut oil to the lower back or abdomen during birthing. And, for perineum support, combine 15-20 drops of Helichrysum to 2 quarter size amounts of fractionated coconut oil and massage on the perineum for support while birthing and as the baby starts to crown. It is a great way to help the skin recover quickly. Clary Sage is used in labor (not to be used during pregnancy but only in labor!) because it supports the respiratory, muscular and uterine body systems. It helps encourage the birthing process because it causes contractions to become more regular or intense. You can use alone, or, together with lavender. To use Clary Sage, put onto a few cotton balls and put near the bed OR birthing area – or, rub right on the skin along with fractionated coconut oil. In some cases, women can use Clary Sage in lieu of pain medication because it helps give them a way to relax and encourage a different frame of thought that helps them escape from the painful contractions of labor and delivery. Not only does Myrrh encourage natural labor (and kick it into gear!) it’s great to put on baby’s umbilical cord. Just one drop will help it dry and fall off faster. Both of these oils can help with alertness (so can Peppermint, too!) while Black Pepper encourages circulation. They are both great to combine with fractionated coconut oil for belly massages. If you are doing a traditional hospital delivery, it’s best to check with the hospital to ensure they will allow you to use Essential oils during your Labor & Delivery. While most may, some may have a no “scent” policy in force, that won’t allow you to use scented items to include essential oils. Keep your Clary Sage handy. Even after delivery as it helps in milk production and to support a healthy hormonal system when applied to the lower abdomen on a daily basis. Using Peppermint after delivery is not recommended if you are a breastfeeding mom – as it can affect your milk supply. You can make a support spray for your Perineal area – combine with distilled water and 1-2 tbsp of Fractionated Coconut Oil in a 4 oz bottle for relief after pregnancy. Just remember that Essential oils have many benefits beyond pregnancy . They can used for just about anything. The oils you will be using for labor & delivery will be well used long after the baby arrives. You can use them to support a healthy milk supply. They are great for helping to calm a fussy baby (and children), support your respiratory and immune system and more. We have a huge collection here at home and use them daily for a variety of reasons- from bath time to cleaning products, immune support and personal care products. 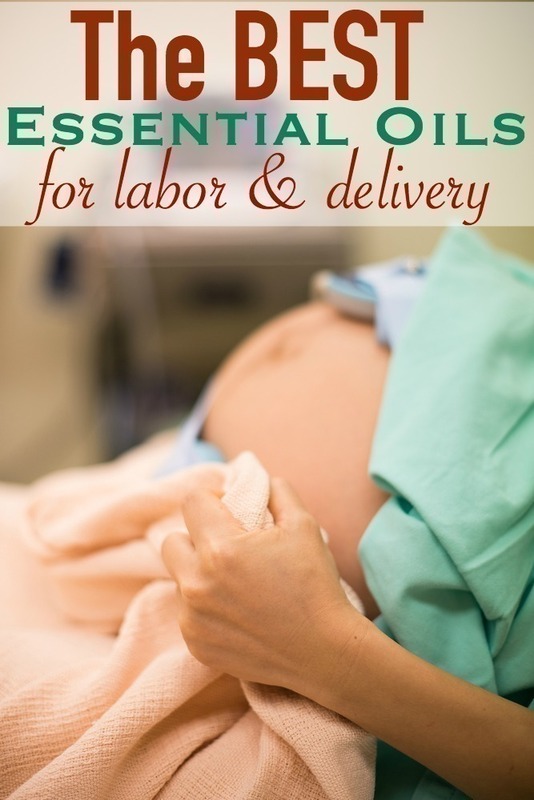 Have you used essential oils during your labor and delivery? What did you find to be the most helpful?